The Seymour Duncan SA-6 Mag Mic is an acoustic pickup that begs the question: "Why mix a magnetic pickup with a microphone?" Because, the magnetic pickup senses the guitar strings' vibrations while the mic accurately reproduces the complex and rich character of the acoustic guitar's tone. Blended together, the result is the most natural-sounding, 3-dimensional soundhole pickup. 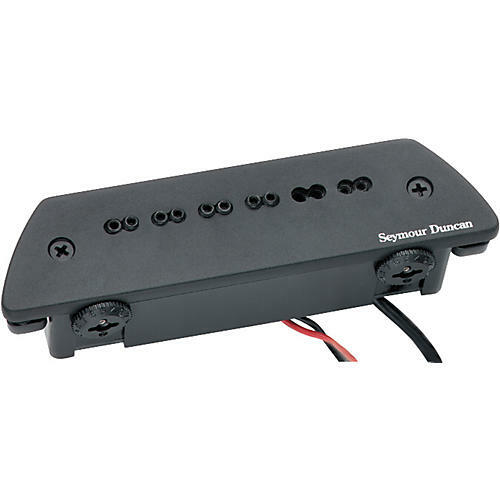 The Seymour Duncan Mag Mic is the first active, humbucking, magnetic soundhole pickup ever created. The SA-6 features a blend circuit and adjustable pole pieces--2 for each string. It uses Seymour Duncan's patented, hum-cancelling stack design to eliminate 60-cycle hum. Permanent or temporary installation is a snap, and the sound is amazing. Deep, rich lows; percussive mids; and shimmering highs. The SA-6 pickup accurately duplicates and amplifies your acoustic guitar's entire sound spectrum. The Mag Mic gets up to 500 hours continuous operation from a single standard 9V battery. You can attach N-size battery clips directly to the Mag Mic pickup for a completely self-contained unit.